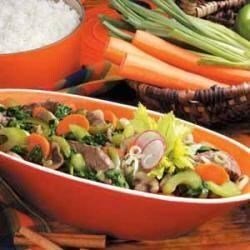 "With tender strips of steak and fresh colorful vegetables, this mouth-watering stir-fry sizzles with flavor! 'My versatile entree can also be made with chicken breasts instead of beef,' says LaVerne Heath of Fountain, North Carolina. 'If you like zucchini or squash, toss some in. A bag of frozen vegetables can also be used.'" Place soy sauce in a large resealable plastic bag; add steak. Seal bag and turn to coat; refrigerate for up to 2 hours. Drain and discard soy sauce. In a bowl, combine the cornstarch, bouillon, five-spice powder and water until smooth; set aside. In a large nonstick skillet or wok, sir-fry beef in batches in 1 tablespoon hot oil until beef is no longer pink. Remove from skillet and set aside. Stir-fry carrots in remaining oil for 2 minutes. Add the green pepper, celery and mushrooms; stir-fry for 3 minutes. Add the water chestnuts and onions; stir-fry for 2 minutes or until vegetables are crisp-tender. Stir cornstarch mixture and add to the pan. Bring to a boil; cook and stir for 2 minutes. Add spinach and beef; cook and stir until spinach is wilted and beef is heated through. Serve over rice if desired. Nutritional Analysis: One serving (1-1/4 cups stir-fry, calculated without rice) equals 280 calories, 13 g fat (3 g saturated fat), 63 mg cholesterol, 597 mg sodium, 16 g carbohydrate, 6 g fiber, 25 g protein. Diabetic Exchanges: 3 lean meat, 2 vegetable, 1/2 starch, 1/2 fat. I used beef broth instead of water and boullion. Double measurement for sauce. This recipe was great, absolutely delicious. I did not have the five spice powder, or the exact vegetables but it turned out great anyway! Thanks for the recipe. Oh my gosh...so good! Did everything exact except served on sesame noodles instead of rice. Might need a little more sauce though if I had served on rice, but with noodles it was perfect! This is one of the best recipes i've made..everyone loves it even my 5 yr old twins, so easy and you can add different veggies..i love it! !